With wedding season around the corner, here's a paper filigree card design I created. The required paper supplies are pretty basic - you'll need brown and white cardstock, light blue pearlized paper, light blue vellum, and 1/8 inch white quilling paper; also silver organdy ribbon and a rubber stamp sentiment - the one I used is by Stampin'Up! You can find complete instructions in the May 2009 issue of CardMaker Magazine. 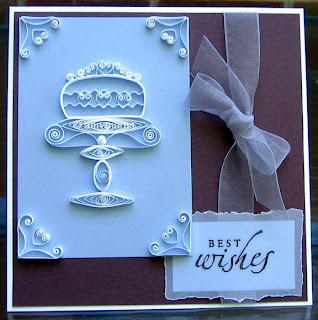 There's also a pretty filigree Mother's Day card by Quilled Creation's Alli Bartkowski in the same issue. This is so beautiful and elegant! Thank you for sharing.